Summary: From the town centre roundabout just off the River Ure this walk follows Milby Cut east and then tracks north over countryside to the quiet village of Kirby Hill before is crossed to the west side of the A1M motorway. Then after a walk south and east back into town we look at historic buildings before walking back into prehistory at the site of the Devil's Arrows, three standing stones which continue to provoke debate as to their origin. It was the Sunday before Christmas and time for a shortest day bar one walk to prepare myself for the festive indulgences lying ahead. 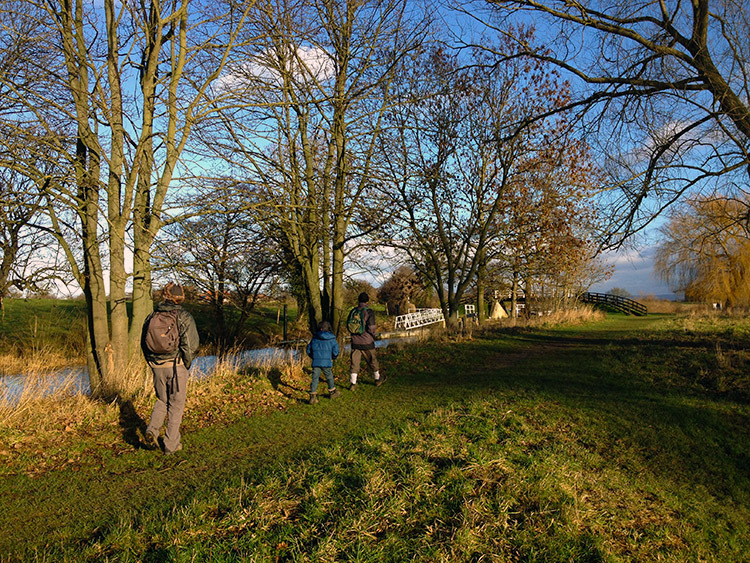 I was joined in my walk for energy by Dave, Mat Partner and his son Will on a crisp Decembers day to search out the best of Boroughbridge and surrounding countryside including the mysterious Devil's Arrows. 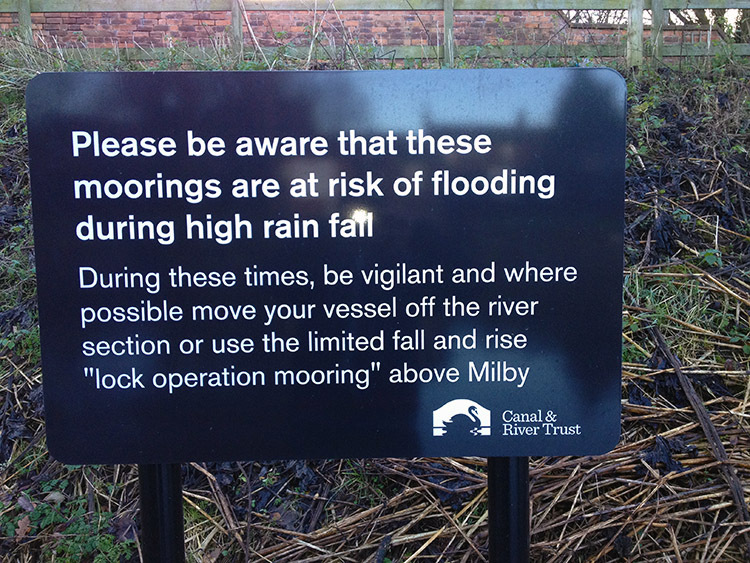 They were for inspection later though as the walk took us from the parking area beside the River Ure close to the roundabout just north of the town centre alongside Milby Cut which was constructed to allow navigable craft bypass Boroughbridge Weir. It was completed in 1769. 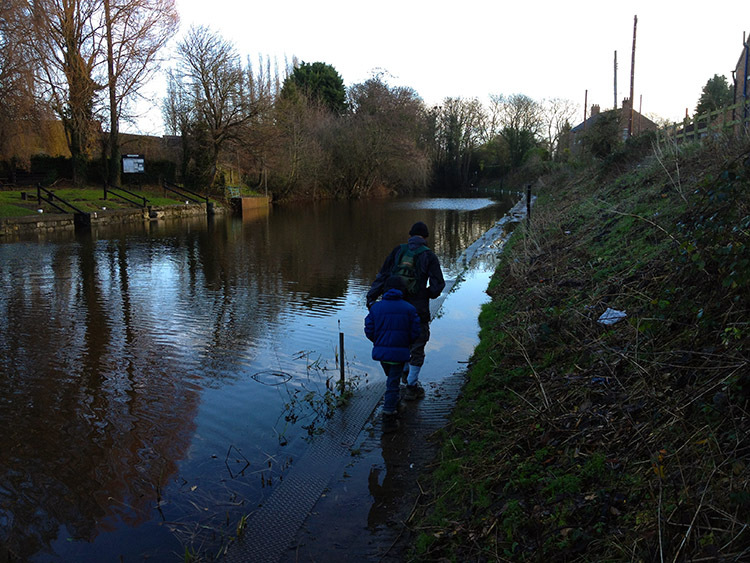 Our first section of walking alongside Milby Cut was on boards just above the water level but not always; the water was high and above the level of the boards so we had to wade very carefully to avoid falling in the deep water. Fortunately the underwater stretch was not too long and soon we climbed a bank to walk along a good path a few feet above the water level. 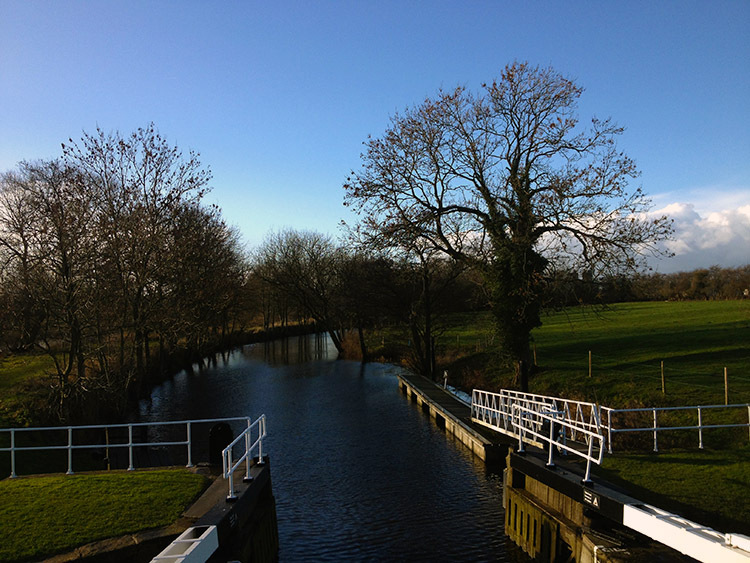 It was a perishing cold day so we were pleased to see the sun come out as we walking towards the lock gate at the east end of Milby Cut. 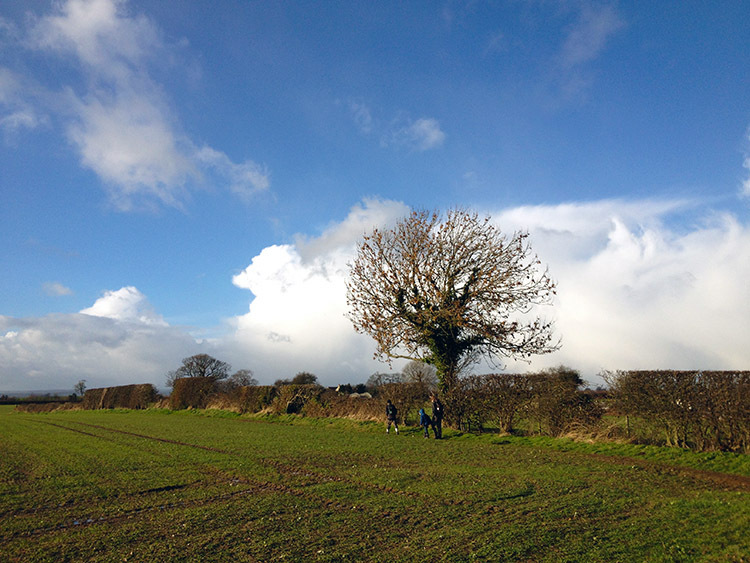 Will marched on ahead with Dave, keenly leading us on our way out of Boroughbridge. The early morning mist was quickly dissipating and the cloud disappearing as we crossed Milby Cut to head north on a hedge lined lane to Crown Farm. 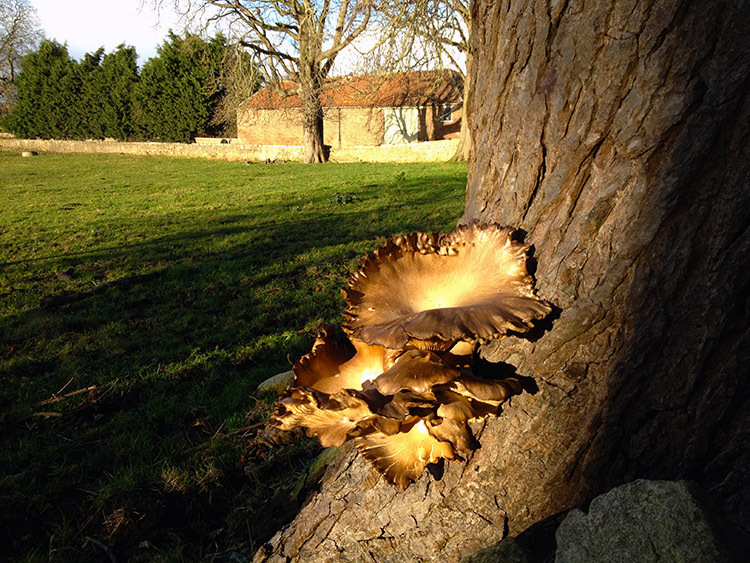 This was the first of three farms passed in quick succession as Manor Farm and then Grange Farm we closely passed too. The inhabitants of these three farms and their resident staff amount to the total population of Milby, restrained north east suburb of Boroughbridge. We did not see any of them as we walked sedately through Milby, not one soul. Apart from our walking the only activity of note was when we encouraged Will to have a swing on one hanging from a tree near Manor Farm. Though he did not need any encouragement. After Grange Farm we followed another tree lined lane towards Kirby Hill, one that was profuse with puddles sunken into the middle of the lane. We kept to the grassed sides often. We came from the unmade to a crossroads a half kilometer from Kirby Hill and followed the west leading road into the village. 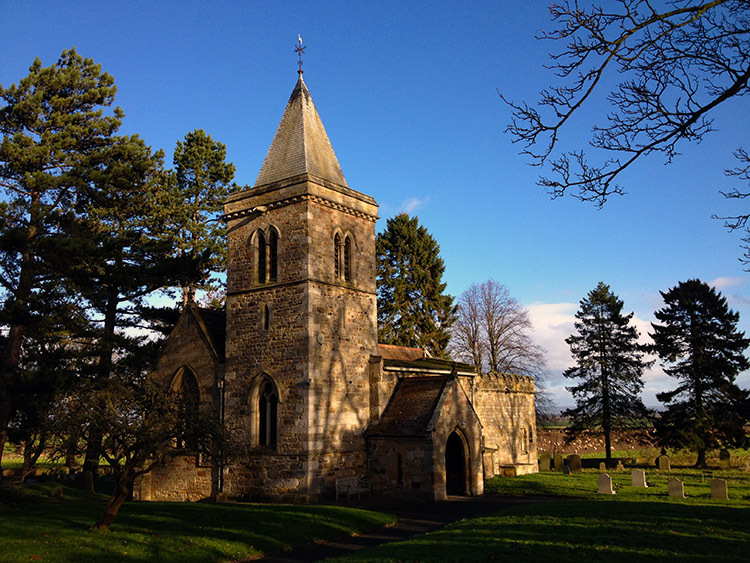 First building of note was the impressive small church, known locally as All Saints' Church Kirby-on-the-Moor. Also in the village was an impressive old stone milepost indicating we were 21 miles from Catterick, 32.5 miles from Piersbridge, 36 miles from Gretabridge, 1 mile from Boroughbridge and 203 miles from London. On checking my maps later I could not find out when Piersbridge is and English Heritage records suggested Gretabridge was listed as 361 miles. After viewing the milepost we left the roadside and followed a track up past houses to a water service reservoir. We could not find the path leading out of the reservoir though so scrimmaged about for a while searching the hedge back before retracing our steps out of the service reservoir grounds. "Where is the path?" thought the adults while Will the sensible young man walked straight to a gate leading the way to a path around the service reservoir. Saved from bewilderment by youth. After the adults fumbling to find the way out of Kirby Hill we followed a clear path by field sides to a small stock bridge over the A1M. 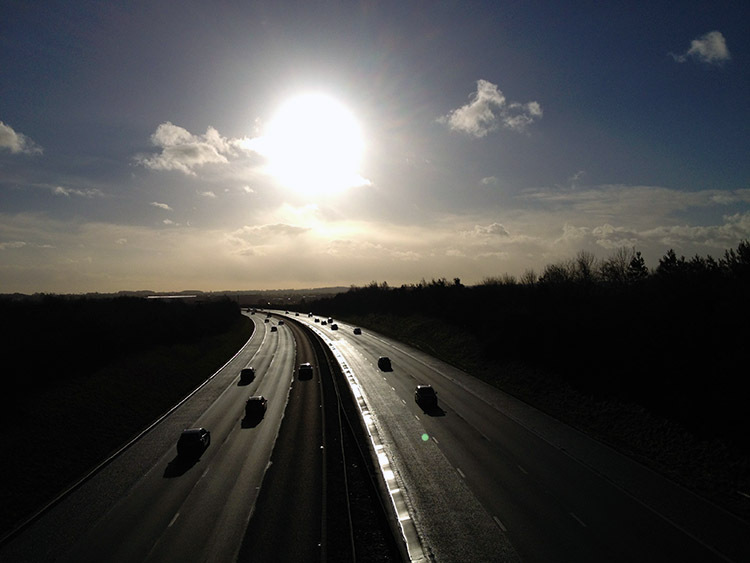 Last weekend before Christmas traffic was travelling north and south on the motorway as we crossed above the road to emerge onto Moor Lane beside Cottage Farm. The lane followed a course south and parallel to the A1M back to Boroughbridge; thankfully a high thick hedge kept the monotonous drone of the traffic hurtling along the motorway from us as we walked along and back towards town. At the end of Moor Lane we turned left and under the motorway along Skelton Road for 800 metres until we cut right through a new estate to the north bank of the River Ure near to Boroughbridge Marina. A flotilla of small pleasure craft were moored on the south bank of the river with more undoubtedly in the shelter of the marina beyond. 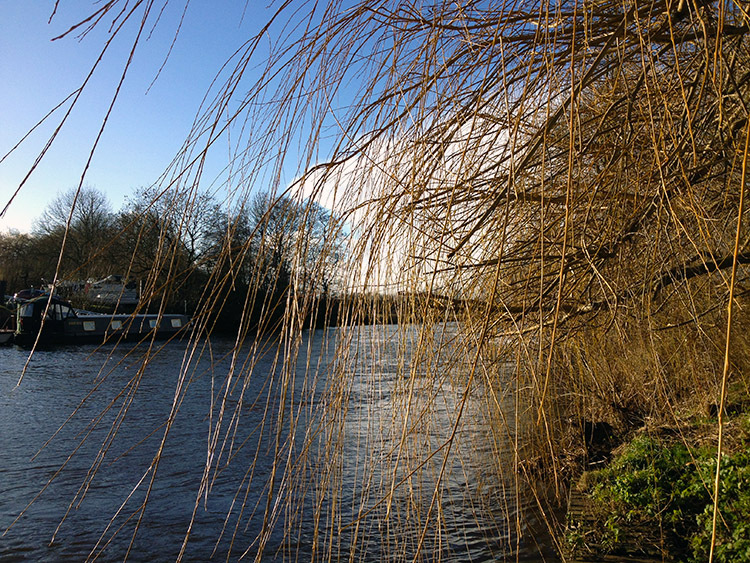 We walked past the marina and along the river bank for 350 metres until we arrived back at my car. That was not the end of the walk though, this one had two loops. One was done and one was still to do. 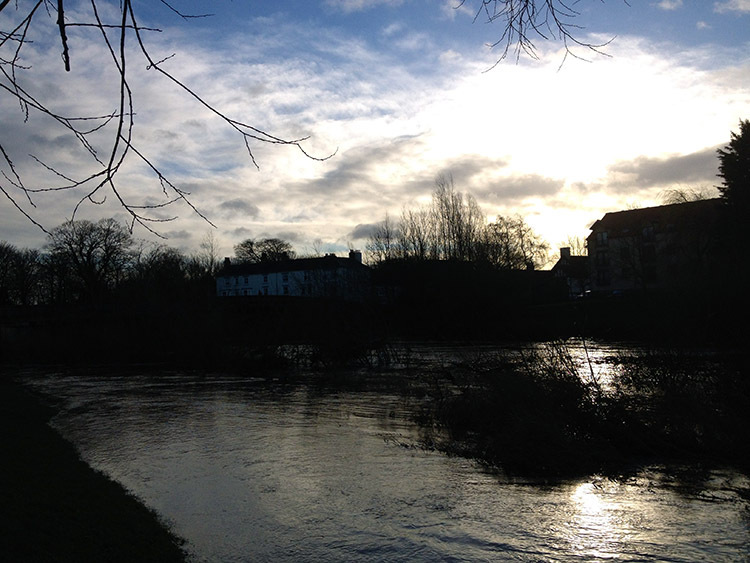 We started the second loop of the walk by heading over the main road bridge over the River Ure southwards into town. 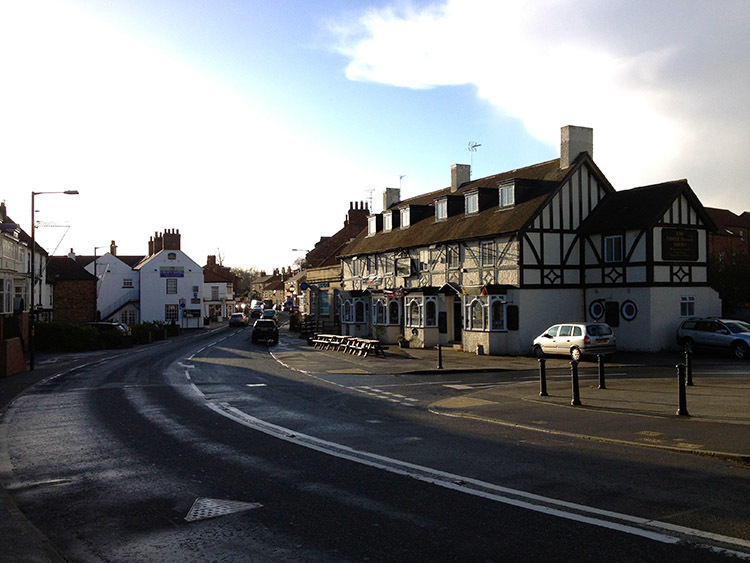 The first building of note we passed was the Three Horse Shoes Inn and then after the Crown Inn Best Western on the east side of the road we turned left into Fishergate and called in for refreshments at a small cafe on Blind Jack's Bridge. I treated my walking colleagues to a drink and a piece of cake each. And it was just as well we stopped, for a sharp shower crossed over Boroughbridge just as we retired to the cafe. We tried to stay it out but it persisted a little too long so we braved the wet as we left the cafe, rounded Fishergate into High Street and dashed to the shelter of the fountain in St James Square. Here Mat and Will had a second bite to eat, of sandwiches pre-prepared, while Dave and I dashed back to inspect Blind Jack's Bridge which we had ignored earlier. It was not the celebrated of the blind Knaresborough mans greatest sights to behold, much of the original bridge blinded off by road and modern buildings. After their tuck Mat and Will followed Dave and I on a slight deviation of route in the search for the Devil's Arrows. (Note: for those of you following my map and trackfiles our unnecessary detour is not included as you have the optimum route to enjoy). Our deviation took us too far south along Wetherby Road, a good half mile too long before we realised we had to walk the whole half mile back to the junction with Roecliffe Lane which we followed westwards on an uphill gradient out of the town. After passing an estate on our right we came to open ground and then we saw them. 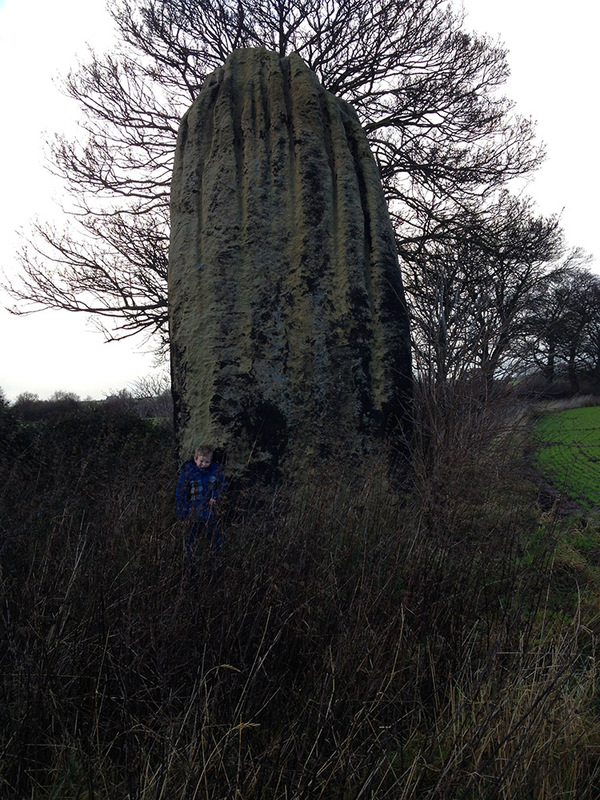 we had reached the Devil's Arrows, three standing stones in an alignment. The south most stone is most accessible, right beside the side of Roecliffe Road. 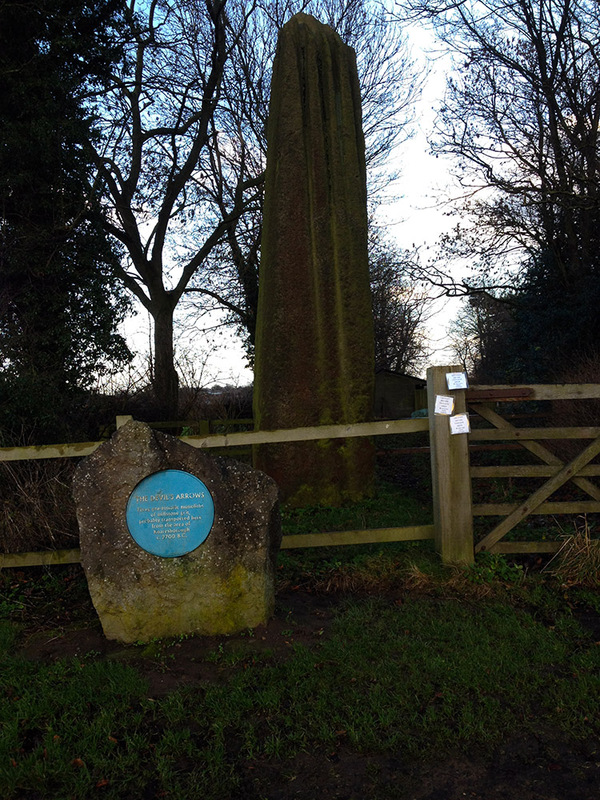 A blue plaque next to the stone states "Three pre-historic monoliths of millstone grit, probably transported here from the area of Knaresborough c.2700 B.C." The central stone sits in the middle of a private field and the south most stone, which is also the broadest, stands on the edge of the field. The history of the stones, of which there were probably more than three is fascinating and can be read here. We spent some time observing the stones and imagining their incredible history before beginning the conclusion of our walk back into Boroughbridge. 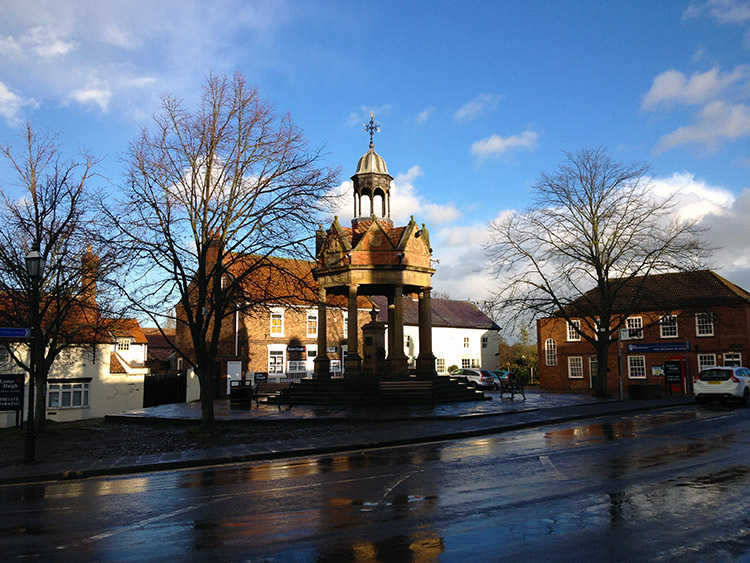 Boroughbridge is a lovely small town and it retains many of its old buildings. 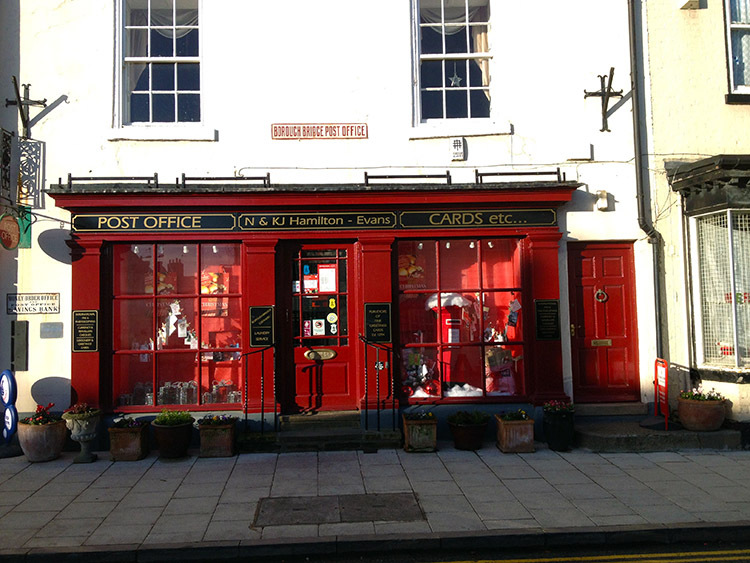 The Post Office is a great example, a lovely red painted shop facade making a quaint image and a vivid contrasting background against a large white building. On passing the Post Office and then the Three Horse Shoes once more we came to the River Ure Bridge and here another blue plaque caught my attention. Attached to the bridge masonry it read "THE BATTLE OF BOROUGHBRIDGE 1322 At the Battle of Boroughbridge, fought at the then wooden bridge, King Edward II's army, commanded by Sir Edward Harcla, defeated the rebel forces of the Earls of Lancaster and Hereford." Some people will travel anywhere for a fight. And some people will travel anywhere for a walk - well, this Boroughbridge is one well worth doing as the countryside is lovely, the town retains a unique character and there are also the Devil's Arrows. 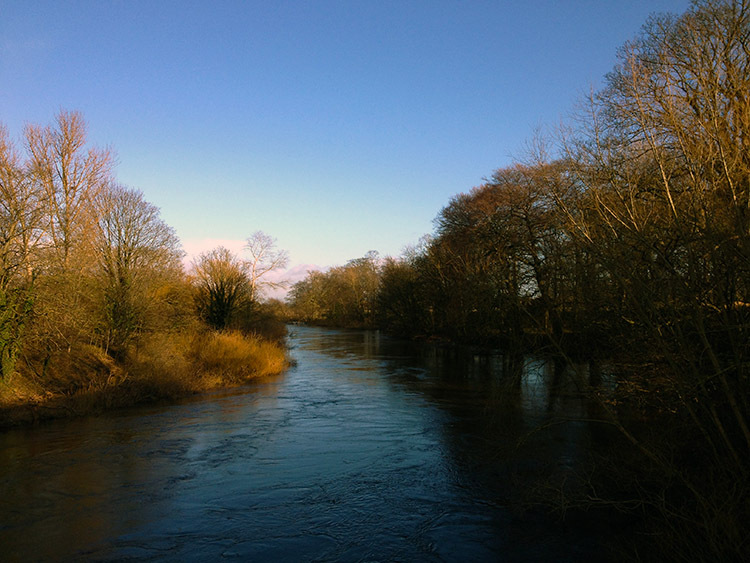 You could make this walk part of a relaxing weekend stay in Boroughbridge.